Doll, Native American Dolls, Porcelain Dolls and Collectibles. Handcrafted Collectible Artist Dolls of Various Materials. Most brides think of their wedding day as the "big day". But there may be no one who puts more emphasis on the word big than a gypsy bride. Her heritage is steeped in tradition, including a legacy of sensational wedding gowns that are brilliant in color, laden with glittering rhinestones and loaded with layers of fabric. Now, this gypsy tradition is re-imagined in this Mirella Bride Doll, a gorgeous porcelain doll created by Master Doll Artist Cindy McClure exclusively for The Ashton-Drake Galleries. This stunning, dark-haired first-ever Collector's Edition grand-jeweled gypsy bride doll - whose name means "adored" - is beautifully handcrafted in the finest bisque porcelain, meticulously hand-painted and softly blushed. Her spectacular gown features a lace appliqued bodice generously adorned with pearlescent beads, shimmering sequins, and dozens of genuine SwarovskiÂ® crystals that twinkle through her gown as they catch the light - for a total of 29 Swarovski crystals! All eyes will be on this stunning bride doll and her amazing gown! The show-stopping skirt features layer upon layer of scalloped tiers of pink satin, white tulle and taffeta, all covering a netted underskirt, satin pantaloons and a sparkling satin and lace garter. Her pink satin belt shimmers with a large Swarovski crystal. Her soft, dark-blue eyes glow with her loving yet strong spirit - paying homage to her Bohemian heritage - while her chestnut-brown hair is gathered in a fluffy ponytail that cascades over her one shoulder. Her crystal tiara, with a large center Swarovski crystal, holds her tulle veil in place. Opulent drop earrings, a rhinestone collar necklace with a sparkling Swarovski drop, and her solitaire diamond-look wedding ring add to her shimmering elegance. Standing an impressive 21 inches tall, she's poseable; gently turn her head to the perfect angle to allow her chandelier earrings to catch the light. Strong demand is expected. Order now! Her heart filled with joyful anticipation of her wedding, this beautiful young maiden carries the blessings of air, earth, water and fire to enrich her union with her true love and to protect the family they will build during their lifetime together. Inspired by ancient lore, award-winning portrait Master Doll Artist Renata Jansen exquisitely combines beauty and symbolism in the Sacred Circle of Love Bride Doll, exclusively from The Ashton-Drake Galleries. 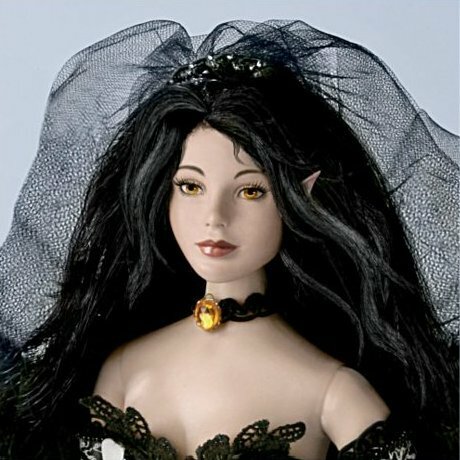 Sculpted for superior realism and handcrafted of fine bisque porcelain for radiant splendor, this collectible bride doll is a classic beauty, from her delicate hand-painted features to her cascading silky raven hair. She is dressed in a magnificent gown befitting her special day, fashioned of hand-painted faux buckskin and enhanced with colorful fringe, intricate beadwork and a decorative pattern of blue and brown stitching. Plus, this beautiful porcelain doll holds a dreamcatcher crafted with real feathers and accented with beads and a silvery charm. Combined with her colorful beaded medallion necklace, these emblems represent the forces of life, spirituality and the Four Directions. Strong demand is anticipated, so don't delay. Order now! On May 19, 2018, Meghan Markle became the newest member of the royal family as she exchanged vows with her beloved Prince Harry in a royal wedding that left the world breathless! And what a radiant bride she was, dressed in a gown that gave a nod to the tradition of royal weddings of the past while expressing her own unique style. To commemorate this historic union, The Ashton-Drake Galleries has captured her beauty with the exclusive Meghan, Royal Romance Bride Doll, a stunning bisque porcelain Collector's Edition doll inspired by the iconic ensemble worn on her wedding day. Standing at 16-inches high, this porcelain collector doll is an enchanting way to relive this real-life fairy tale romance! Exuding royal elegance, this true-to-life Meghan porcelain collector doll is handcrafted and expertly hand-painted to highlight her lovely features, and is poseable to perfectly showcase her unforgettable bridal ensemble boasting authentic details. From her magnificent white satin wedding gown with a bateau neckline and A-line silhouette to her dramatic drop veil blusher with scalloped lace, every nuance of her wedding day detail has inspired this exquisite bride doll. Her dazzling accessories including her bandeau tiara, stud earrings and sculpted bridal ring set sparkle with genuine SwarovskiÂ® crystals, and her delicate bouquet completes her breathtaking look. Worldwide demand for this must-have royal family collectible tribute is likely to be high, so don't delay. Order now! Their love first took root in a garden filled with blooms. Now, they will be joined together forever in the same romantic setting, and you are invited to join in the celebration with this breathtaking Collector's Edition Love in Bloom Bride Doll. Brought to life by award-winning Master Doll Artist Sandra Bilotto and available only from The Ashton-Drake Galleries, she is a radiant rose herself, as fresh as a summer's day! Standing a proud 21 inches tall, she is poseable, handcrafted in fine bisque porcelain and hand-painted to capture every lovely nuance of Sandra Bilotto's original sculpting, with large expressive eyes, a dainty nose, and a subtle smile that hints at her excitement on this special day. Everyone who sees this lovely bisque porcelain bride doll is sure to be completely captivated by her beauty - and her spectacular ensemble. The focal point of her magnificent couture-inspired gown is its layered skirt, with huge roses printed on white satin, peeking out from beneath two layers of organza shimmering with glittery accents. Her classic sweetheart bodice sparkles with hand-applied rhinestones, while a pink organza belt is drawn into a huge bow at the back of the gown, creating a contemporary version of a train. Her upswept hair and fingertip veil are crowned by satiny blooms, perfectly complemented by the faux pearls and rhinestones of her jewelry and silk flower bouquet. No detail has been overlooked, from the bride's pumps to her delicate bloomers and traditional garter. Don't miss your chance to be a part of this romantic celebration - strong demand is expected for this Sandra Bilotto collectible doll! Order now! Theirs was the most unexpected of love stories: A rag doll and a skeleton called the Pumpkin King realize they have fallen head-over-heels for each other. If you've been wondering what happened next, now you can let your imagination run wild with the Jack and Sally's Nightmare Romance Doll Set, a Collector's Edition two-doll set from The Ashton-Drake Galleries and licensed from Disney. From Sally's pretty blue face and rag doll stitches to Jack's enormous smile and bony fingers, these Nightmare Before Christmas dolls are expertly sculpted and handcrafted in artist's resin and thoughtfully hand-painted for a deeply romantic three-dimensional portrait. In a scene inspired by the cult classic, Ashton-Drake artisans imagine a wonderfully romantic occasion for this beloved Halloween Town couple. Beautifully handcrafted, Jack and Sally look their very best in festive attire that would most certainly land them on Halloween Town's best dressed list. Sally looks her very best in a floor-sweeping fabric gown with a patch-work pattern; the form-fitting bodice shows off her trim figure to perfection. A veil crowns her crimson, hand-applied hair, and she holds a bouquet of beautifully arranged (and wilted) dead roses. Jack is debonair in a black pin-striped tuxedo with the bat bow tie he saves for only the most special occasions. Look closely and you'll see the perfect cuff on his trim pants, right above his sculpted black dress shoes. Jack's elbows, shoulders and legs are poseable and Sally's head turns from side to side and you can gently bend her legs. Just imagine all the eye-popping display possibilities when the happy couple arrives in your home! These Disney's Tim Burton's The Nightmare Before Christmas collectibles are perfect for any fan. Strong demand is anticipated, so don't wait. Order now! Inspired by Nene Thomas's highly sought fantasy artwork, "A Moment in Time" is a breathtaking fantasy bride doll, elegantly sculpted, handcrafted of artist-quality vinyl and hand-painted to capture every gorgeous detail. Offered exclusively by The Ashton-Drake Galleries, this stunning fairy bride doll will add memorable touches of elegance and romance to your collection.This beautiful fantasy bride doll fully recreates the details of Nene Thomas art, from the curling feathers in her hair, to her graceful black and white fairy wings trimmed with feathers, to her sapphire-blue eyes. Her ice-blue wedding dress is artfully draped and delicately accented with lace. Delicate faux orchids serve as her headpiece and her bouquet, and she comes complete with wedding masque (not shown). This remarkable doll is also fully articulated so you can pose her in so many wonderful ways. Demand is expected to be strong for this Nene Thomas-inspired masterpiece, so order now! By the glow of a winter moon, she promises to love him today, tomorrow and forever. This enchanting vision is now yours to cherish with the Winter Romance Bride Doll, exclusively from The Ashton-Drake Galleries. Gorgeously attired in a lavishly detailed, couture-inspired winter wedding ensemble, this Collector's Edition bride doll by Master Doll Artist Cindy McClure is a timeless vision of grace and beauty presented in luminous bisque porcelain. An impressive 21 inches tall with a soft cloth body, she is poseable to become the centerpiece of any room. This Cindy McClure doll is handcrafted to bring the artist's skillful original sculpting to life, with striking porcelain features that are hand-painted and delicately blushed. Her stunning 10-piece ensemble includes a wedding gown and bridal coat tailored with rich satin, faux suede and lace fabrics and adorned with sparkling rhinestones and sequins, soft faux feathers, faux fur, silver threading, beaded trim and more. Her brunette hair is piled high and clasped with a unique headpiece crafted with rhinestones, faux pearls and soft faux feathers, and she holds a bouquet of fabric flowers interwoven with crystal accents and more faux pearls. This collectible doll even includes a dress form on a mahogany-finished base for displaying her elegant coat. Cindy McClure's bride dolls are highly coveted, and strong demand is anticipated for this unique Collector's Edition doll. So hurry, order now! With this extraordinary fantasy art bride doll as your guide, you are swept into the world of renowned fantasy artist Nene Thomas to experience the mystical beauty of her art. 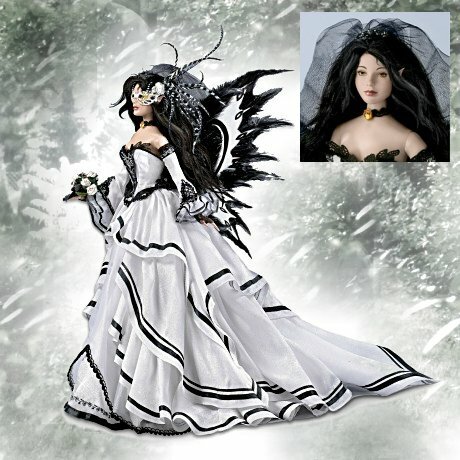 This first-ever Nene Thomas fantasy art bride doll is a stunning, poseable vinyl doll inspired by Nene Thomas's "Owl Bride" painting - a vision of a masked fairy bride in exquisite black-and-white attire with gorgeous wings, walking through the snowy forest on her wedding day.Available exclusively from The Ashton-Drake Galleries, this fantasy art bride doll is amazingly detailed to recreate the important elements in Nene Thomas's painting. From her delicately pointed fairy ears and amber eyes, to her lavish, multi-tiered gown, to her exquisite mask and elaborately detailed fairy wings, this fantasy art bride doll is a breathtaking collectible treasure. Now is your chance to bring Nene Thomas's artistic vision into your home, but don't wait. High demand from Nene Thomas fans is expected. Order now! Every bride dreams of feeling like a princess on her wedding day, and the right ensemble is essential to making that fairy tale come true! Now, the romance and enchantment of that special day is beautifully captured in the Happily Ever After Bride Doll, exclusively from The Ashton-Drake Galleries. Commissioned from award-winning Master Doll Artist Cindy McClure to celebrate Ashton-Drake's 30th anniversary, this stunning bride doll excites from every angle, from her sparkling tiara to her "something blue" heels! Impressively sized at 21-inches tall, this poseable bride doll is exquisitely handcrafted in fine bisque porcelain and expertly hand-painted with artistic details including delicate blushing, carefully applied eyebrows and even the perfect manicure! Bringing together the very best of today's trends with the fairy tale features that never go out of style, this porcelain bride doll wears a satin and tulle gown that boasts glitter, rhinestones and five hand-applied blue SwarovskiÂ® crystals on the bodice. Her tiara, drop earrings, necklace, and cathedral-length tulle veil are also bedecked with glittering rhinestones. Beneath it all she wears an underskirt, pantaloons and the lace-covered garter that tradition demands. Strong demand is expected, so don't wait to bring home our spectacular 30th anniversary bride doll by Cindy McClure. Order now!